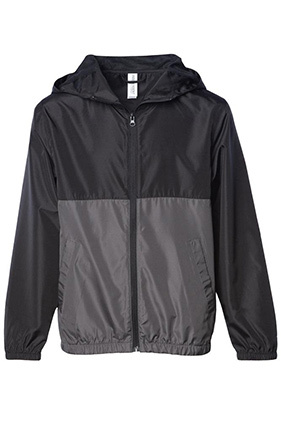 This lightweight windbreaker packs easily and is great for layering and all weather conditions. Get outside and enjoy! 100% polyester youth windbreaker with interior water resistant coating. Waterproof Pressure Resistance: 600 mm. Matte finish #4 reverse coil zipper. Fine mesh hood liner. Soft to touch. Three panel hood & scuba neck. Welt pockets with mesh pocket bags. Elastic cuffs and waistband. Self neck tape with locker loop in center back. Screen print friendly.